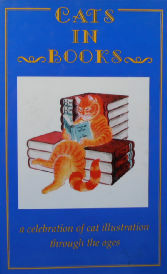 The sub-title of this hard back book is "a celebration of cat illustration through the ages". The book features illustrations from the religious gospels and early fables to Kliban cat and Garfield. Detailed picture index and text index at the back. The books is 5 1/4" wide x 8" high. Copyright 1997, 112 pages. Previously owned but in good condition.